The Apple iPhone 6. (Image: Apple). Updated Sept. 11, 12:01 am EST, to include analyst Christie Christelis’ comments. Apple Inc. made a slew of new announcements today, including the launch of the latest iPhone, Apple Pay, its mobile payments system, and the Apple Watch, the device maker’s long-awaited take on the smartwatch. It’ll be some time before we’ll get to check out these new devices, but with analysts weighing in on some of Apple’s biggest announcements, we’re getting a good sense of how the Cupertino, Calif.-based company’s latest news will affect the tech landscape. As expected, one of the first announcements to be made was the new iPhone, coming in two versions – the iPhone 6, at 4.7 inches, and the iPhone 6 Plus, at a hefty 5.5 inches. While that’s not quite as big as the Samsung Galaxy Note 4, which is a whopping 5.7 inches, it’s still definitely a jump in screen size for Apple. The phones are also the thinnest so far, with the iPhone 6 at 6.9 millimetres and the iPhone 6 Plus at 7.1 millimetres, with displays of 1334 x 750 pixels and 1920 x 1080 pixels, respectively. Apple has also added a new A8 chip for improved CPU and graphics performance, as well as an M8 motion coprocessor for picking up on users’ physical steps, distance travelled, and changes in elevation. Apple also made improvements to its camera, adding features to its eight megapixel (MP) iSight camera with focus pixels, improved face detection, and exposure control. 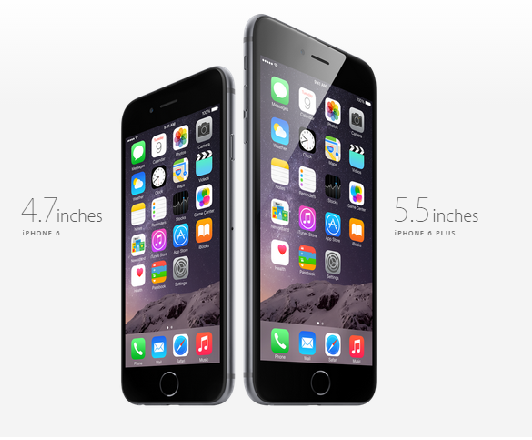 The iPhone 6 and the iPhone 6 Plus. (Image: Apple). “The bigger screen size on the phone – both 4.7 [inches] on iPhone 6, and 5.5 [inches] on the iPhone 6 Plus, was a really important upgrade, and one that will help to continue to make their phones competitive compared to the increasingly large phones in the market,” said Krista Napier, an analyst at IDC Canada, in an email. While Napier said she felt there’s a lot of “pent-up demand” among iPhone users for the new devices, Canaccord Genuity analyst Dvai Ghose said he feels nothing here will really wow Canadian consumers or knock them off their feet. “We believe that devices like the iPhone are slowly losing their iconic status and will become commoditized over time, to the potential benefit of all wireless carriers,” he noted in an email, adding most new iPhone buyers will probably be existing iPhone users who want to upgrade. The iPhone 6 and the iPhone 6 Plus will land in Canada Sept. 19, with pre-orders available Sept. 12. Pricing with carriers on a two-year contract start at $199 for the iPhone 6, with 16 gigabytes (GB) of storage, while the 16 GB version of the iPhone 6 Plus is set at $299. Like Apple observed on its keynote slides, there hasn’t been a ton of traction among consumers for mobile wallets and mobile payments systems. However, Apple is hoping to change that, rolling out Apple Pay, a system that uses a new near-field communication (NFC) antenna on the iPhone. By taking pictures of their credit cards, users can add cards to their digital wallet and pay by tapping their iPhones to a point-of-sales system, without needing to carry the physical cards themselves. Adding NFC capability was already a departure for Apple, as this is the first time it’s done that, but the company also tried to appeal to consumers through promising not to collect consumers’ data on what they’re buying, nor sharing their credit card numbers with cashiers and merchants. “Focusing on privacy and security is a smart move for Apple with the launch of Apple Pay, as consumers consistently cite these concerns when asked why they don’t use mobile payments,” said Brian Yeager, a financial services analyst for eMarketer, in an email. Plus, the choice of using NFC, rather than something like QR codes, could push merchants to adopt the technology as well, he noted. He added Apple has also done well by partnering with an impressive roster of merchant partners, including Macy’s, Whole Foods, Disney, and McDonald’s, though he noted in-store support is missing for retailers like Walmart, CVS, Costco, and Best Buy. Christie Christelis, a mobile payments analyst with TSIGlobalnet, said he expects with Apple’s entrance into mobile payments, the market should develop in the next three to five years. Still, a lot of Apple’s system is still shrouded in mystery, he noted. While we’ve been calling it the iWatch, Apple is actually branding its version of a smartwatch as the Apple Watch, aiming to make it both fashionable and functional. With two different sizes, at 38mm and 42mm, as well as three different models – the Watch, the Watch Sport, and the Watch Edition – Apple has loaded its smartwatch with features for fitness tracking and communications through instant messaging, voice calls, and email. What’s interesting about Apple’s version of the watch is that it’s got a Digital Crown on the side, a little dial that allows users to scroll through options on the watch’s screen. 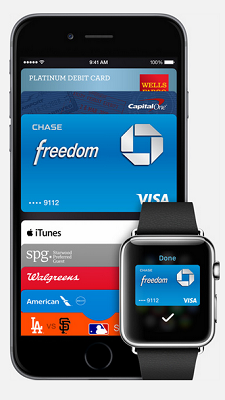 It also moved quickly on the mobile payments side, equipping the watch with the ability to pay for goods and services through Passbook, Apple’s tool for storing tickets, boarding passes, gift cards, and debit and credit cards. However, it’s not a device that comes cheap, and Apple said nothing about its battery life. (Worth noting, considering one of the biggest complaints about the Android-powered Moto 360 seems to be its sub-par battery life). “Apple Watch [is] a very good start and addressed several of the big concerns that surfaced as barriers to consumers buying a smart watch— technical prowess, unique features, style. There are still barriers though, the biggest is the price, which is higher than the base price of the new phone,” said Cathy Boyle, senior mobile analyst at eMarketer, in an email. She also noted the watch is pretty expensive, with a starting price tag of $349. The Apple Watch. (Image: Apple). Napier agreed with Boyle, though she added it’s still “early days” for wearables. 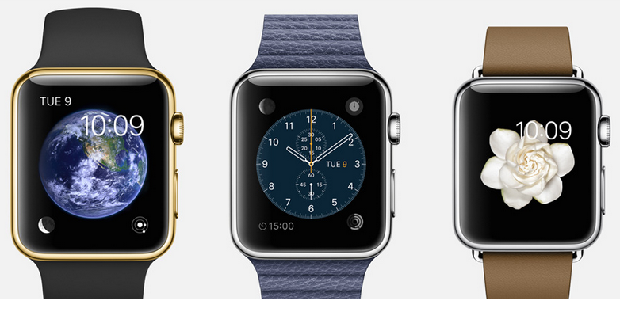 The Apple Watch will become available in early 2015, though there’s no word as to when it’ll land in Canada.